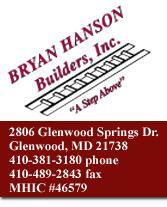 Since 1993, Bryan Hanson Builders has been building dreams into reality for hundreds of clients in Howard County, Maryland. A hands-on approach allows Hanson to manage his projects with precision. With 25 years of experience, he is a hard-working craftsman at heart. On a professional level, he is a consultative business owner and has taken industry courses over the years to stay abreast of code requirements and trends of the trade. We are insured and licensed by the Maryland Home Improvement commission. MHIC #46579. Bryan Hanson Builders is affiliated with trex.com and timbertech.com. For more information or to discuss your next project, call Bryan at 410-381-3180 or email Bryan. Bryan Hanson believes in a commitment to craftsmanship. Click above to view some of his latest work where artistry meets practicality. Bryan Hanson has the knowledge, experience, and strong relationships with other skilled craftsmen in his field to ensure that your next project meets the quality and workmanship you demand. "In this industry, referrals are key to building a successful business. I work hard to maintain my reputation in Howard County," says Hanson.